The NuWave DAC is an affordable high end digital to analog processor from PS Audio, based on our acclaimed PerfectWave series. The NWD accepts inputs from any digital source including USB (up to 192kHz 24 bit asynchronous) and connects to your system's preamplifier with either RCA or XLR connections. 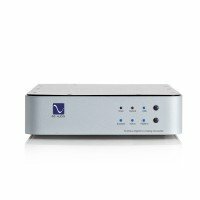 Used with any music management software like iTunes, Bit Perfect, Amarra, or J River and an iPhone or Droid controller, the NWD becomes your entry into the world of high end streaming digital audio. The NWD features the latest fully balanced generation of 192kHz 24 Bit resolution Burr Brown engines with 123dB dynamic performance and rated THD a stunningly low 0.0005%.It comes with differential outputs, an 8 times oversampling filter, Native mode, XMOS asynchronous USB processor, new low jitter clocks providing exceptionally lifelike audio. Our engineers based the NWD around a solid high performance DAC engine, state of the art XMOS processor and then designed an all new input circuit based on the PerfectWave low jitter clocks, a 100% discrete output stage and a huge power supply to finish it off. This is true high end. You won't find any chip op amps in this product. In the 23 years we have been making DAC's the NWD is the sweetest, warmest, most open and musical DAC we have yet built in this affordable category. It will bring new life to your entire music collection regardless of whether it's on your computer or your discs. Regardless of what you have for a transport, from a low cost CD player with an optical output, Apple Airport Express or TV, computer, or even the highest end transport on the market, adding the NWD to your system will bring your music to life. If you have any questions about this product by PS Audio, contact us by completing and submitting the form below. If you are looking for a specif part number, please include it with your message.